We’ve also been falling in love with lots of dogs, eating artisan chocolate-covered bananas, and gathering recipes from the cook at our house, Ana. I thought it was only fair that I should share the group’s overall favorite Ana recipe so far: Coco Pie (Coconut Pie, in English). And since this is blog is dedicated to writing and writing prompts, and I’m officially reporting from a writing retreat in Mexico, it seems important that I include writing prompts as well. 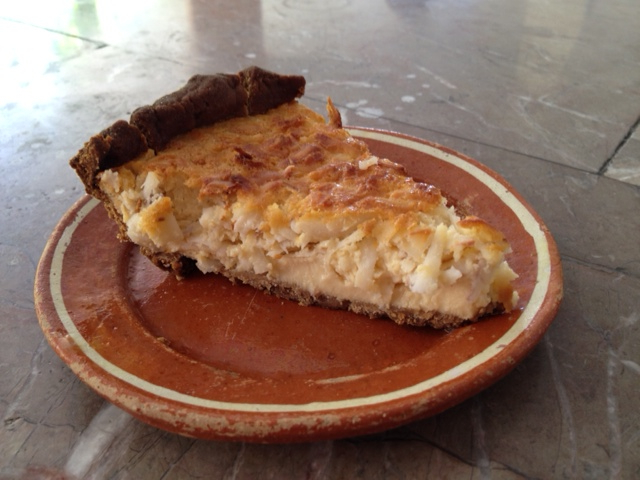 Here are a few that worked well for us this week; Ana’s pie recipe follows the prompts. Pour mixture over coconut and bake at 250 degrees for 45 minutes, checking to make sure the crust doesn’t burn.